Expresso Property and Holmes Miller Architects have brought forward plans for the latest addition to Glasgow’s Pacific Quay, a waterfront office block offering some 60.000sq/ft of accommodation. Incorporating a lower ground floor providing 30 car parking spaces and cycle storage the property will be finished in a variety of fibre cement boards and metallic panels. Welded stainless steel mesh will be used to clad a circulation core. Explaining their plans for open space Holmes Miller wrote: “The site is exposed to the prevailing west and north east winds. Hedging and raised planting areas have been introduced to assist in filtering winds to make it more comfortable to walk, sit and gather. 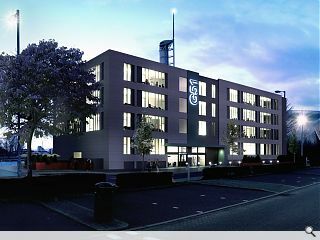 Surrounded by new paving and planting the building will be branded as ‘G51’. All that's missing form this is imagination and talent. The lack of ambition here is staggering. Surely in this site, located right next to some of Glasgow's most 'iconic' (there's that word again) new buildings, we can do better than this? Its actually sympathetic to the neighbouring buildings, sadly. Once again, an utterly insipid proposal at a site that has great potential. Why does nobody have any sort of imagination for this area? Its as if they think the science museum and tower are the showpieces and everything else can just be generic bland boxes. We need something MORE ambitious than the science centre not generic filler. The large derelict site next to the existing offices could be transformed into a landscaped bar/cafe area and could actually bring people to this area. The lack of foresight and attempt to capitalise on this area is astonishing. They have all these 'iconic' buildings but nothing in the way of cafes, bars, restaraunts, or shops that would actually bring people here that aren't going to the hydro or visiting a museum.